This highboy features mahogany casework set off by figured maple drawer fronts, center finial, and traditional Queen Anne legs. The legs have an over-the-apron style knee block that visually finishes their sweep. I fashioned this chest after a 1748 piece designed by colonial cabinetmaker Christopher Townsend. 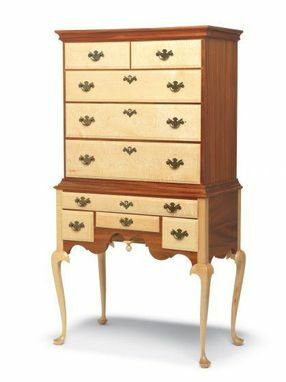 With a highly shaped skirt and spoon feet, my highboy is an example of a typical Rhode Island flattop. This chest features classic hardware from Horton Brass, in an antique finish. No detail is overlooked with this heirloom piece of furniture, from hand cut dovetailed casework and drawers to hand carved moldings. The warmth of the natural mahogany will add appeal to any room in your home. Each piece is custom made-to-order, please allow 6-8 weeks. The price is for local pick up only. I can help you arrange shipping, I offer standard crating and white glove delivery (pricing will vary).